If anyone is puzzled about what “snakebite” is, it’s a beer/cider cocktail that is often incorrectly believed to be illegal to serve in pubs in the UK. Well, it’s the end of the month and that means that it’s time for me to collect the usual list of links to my ten favourite articles about making comics and/or making art that I’ve posted here over the past month (plus a couple of honourable mentions too). If you’re wondering about the second row of panels, it’s kind of a long-running (but occasionally forgotten) tradition with this comic series that, when Harvey is alone, the world looks like something from an old movie. The Apogee logo. Many of the first games I ever played were from this company, who also invented shareware too. Although the actual game doesn’t really look that much like this, the menu uses this really cool high-contrast style. One of their other games, called “Paganitzu”, uses a version of this style a lot more prominently too. This is a reduced-size preview. The full-size painting will be posted here on the 4th January. Sometimes this sort of thing can happen when other people see your art too. This is especially true when you show your art to people who knew you when you were younger and probably remember the things you used to read/watch/play. 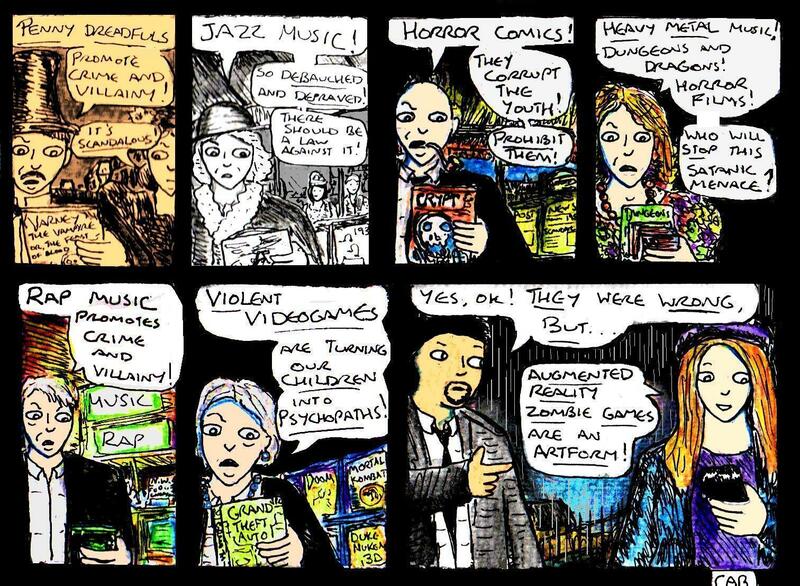 Yes, sometimes your art might remind other people of things that you’ve never actually seen/read/played. This is always weird when it happens, but it’s usually because both you and the thing in question share a common inspiration or because you’ve been inspired by something that was inspired by the other thing. Either way, it’s helped you find another influence on your art that you didn’t know about. 2) Nostalgia: Another good way to find hidden influences on your art style is to be nostalgic. Look back on the things that you really enjoyed when you were younger (but only remember vaguely) and, now that you’re older, you’ll probably begin to notice some slight similarities between them and your own art. This obviously won’t work with everything, but it can be really surprising when it happens. After all, even though you may not have been an artist at the time when you first saw these things, they’ve probably had some influence on your imagination if they impressed you enough that you still vaguely remembered them years or decades later. The important thing to remember here is to focus on personal nostalgia (eg: things you actually remember from the time) rather than the stylised “nostalgia” that appears in the mainstream media. If you grew up in the 90s, then you probably have a slight advantage here since 90s nostalgia is only just really starting to become mainstream these days (compared to, say, 1960s-80s nostalgia). 3) Take influence/inspiration often: The best way to recognise hidden influences is simply to know how to take influence/inspiration from things. If you try to improve your art by looking at the things that impress you and working out how and why they do this (and applying those lessons to your own art), then you’re going to have a much better understanding of how inspiration and influence works. Once you know this, then spotting “hidden” influences becomes a lot easier, for the simple reason that you know what sort of things to look for. And, yes, they’re both real books. Although, at the time of writing, I ended up reading an electronic version of “Pursuit Of The House- Boat” (it’s out of copyright and can legally be read for free here) and I’ve only read a couple of chapters from “Varney The Vampyre” ( although it’s also out of copyright, I ended up getting a print copy on account of it’s length though. Plus, although the copy I got attributes authorship to James Malcolm Rymer, some people believe it was written by Thomas Preskett Prest). Well, after looking through my CD collection and realising that 1994 was an absolutely amazing year for American punk music, I thought that it was time to write yet another article about the 1990s. In particular, I’ll be looking at some of the reasons why the 1990s was such a creative decade. 1) The world was less connected: Yes, the world wide web existed during the 1990s. But, it was a lot slower, more primitive and less widely used than it is today. In other words, the world was a lot less connected than it is today. What does this have to do with creativity? Well, it meant that there was a lot more variation between creative works. These days, if we’re interested in creating something different, we can just look it up on the internet and learn everything about it. Back then, you’d have had to read books, look for videos etc.. and then use your imagination to extrapolate from whatever research material you could find. This probably led to more variation between creative works about the same subject. In addition to this, the lack of connections meant that creative works tended to reflect their surroundings a bit more too. This is why, for example, Californian punk music from the 1990s (eg: Bad Religion, The Offspring, Green Day etc..) often tends to have a fairly distinctive worldview and attitude. Likewise, the 1990s was a golden age for sitcoms here in Britain, and the differences in humour, attitude, characters etc.. between British and American sitcoms from the time are surprisingly pronounced. So, when the world was less connected, people had to use their imaginations more and there also tended to be a lot more variation between both individuals and locations. 2) People did more with less: Back in the 1990s, film budgets were slightly lower than they are today (plus, mid-budget films still existed!). Back in the 1990s, computer and video game technology was a lot more basic than it is now. Back in the 1990s, TV shows often had even lower budgets than many films do. Now, you’d expect all of this to have a damaging effect on the levels of creativity in the world. But, it didn’t. Because creative people had less, they had to find ways to do more with it. They had to find clever ways to make things seem more spectacular or expensive than they actually were. In other words, they had to focus on the things that don’t cost much. These include old-fashioned things like good storytelling, clever humour, good game design, imaginative ideas, unique art styles, emotional depth, good characterisation etc.. that mostly seem to have gone out of fashion in modern mass culture. Because film-makers couldn’t dazzle the audience with multi-million dollar CGI effects and game makers couldn’t use photo-realistic 3D graphics, they had to focus on other ways to keep the audience interested. In other words, they actually had to use imagination and creativity. 3) Culture: I can only speak for British (and maybe American) cultural history here, but there were so many creativity-friendly cultural differences in the 1990s compared to today. The first is that, relatively speaking, the 1990s was a happier age. The cold war had ended and 9/11 hadn’t happened yet. The future seemed bright and optimistic. Of course, what this meant is that if anyone wanted to make anything thrilling, scary, dramatic, rebellious etc… then they couldn’t just look at the newspaper to get ideas. They actually had to think and to use their imaginations a bit more. Likewise, the 1990s – in Britain especially- was a much more liberal decade in the traditional sense of the world. 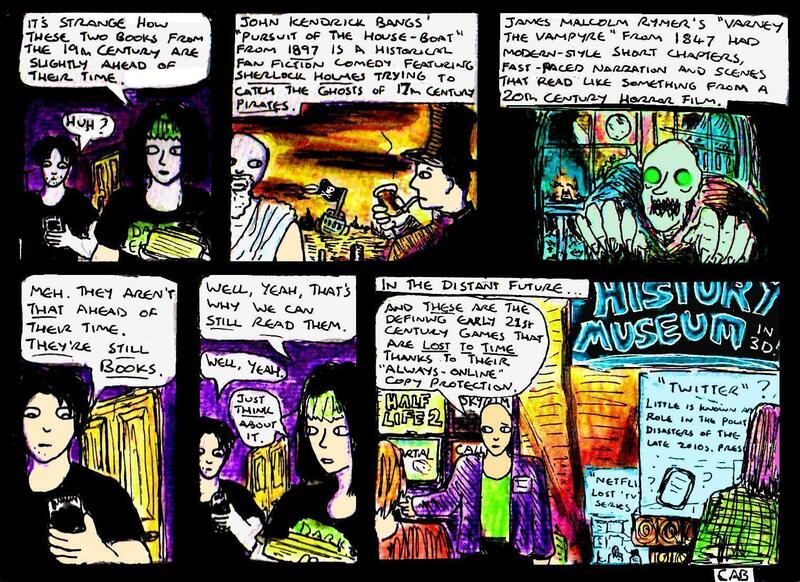 This was a decade where hedonism was celebrated, where being “edgy”, “controversial” and/or “rebellious” was cool etc… This was a decade where punk music was in the charts and where even a few manufactured pop groups tried to have some kind of a punk-like attitude (eg: The Spice Girls). This was a decade where LGBT-themed drama started appearing on television (eg: “Queer as Folk” in the UK and “Ellen” in the US). This was a decade where free speech and rebelling against the establishment mattered much more than it seems to today. In a more general sense, culture at the time also tended to be more eager to reinvent things. Films like “Scream” and TV shows like “Buffy The Vampire Slayer” wanted to look at the horror genre from different perspectives. Established genres were re-imagined in interesting ways (eg: “Lois & Clark: The New Adventures Of Superman” turns the superhero genre into a light-hearted romantic comedy, and it’s really great 🙂 But, it’d never be made in this modern age of “ultra-serious” superhero movies. ). Although it probably wasn’t perfect, the culture of the 1990s just seems to have been far more creativity-orientated than modern culture is. Woo hoo! 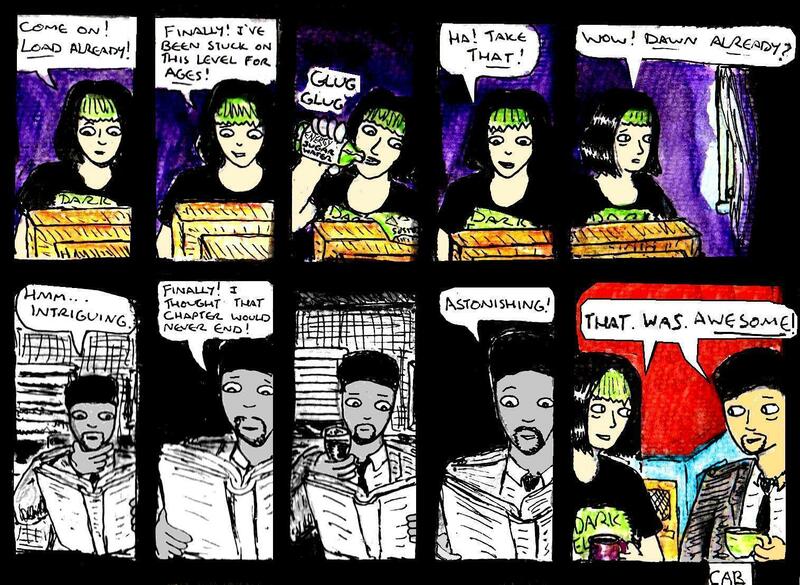 I am very proud to present the first comic in my “Damania Revitalised” webcomic mini series. At the time of writing, I’m not sure how long this mini series will be (at a guess, probably 4-6 comics). But, it’s been a while since my last mini series, so I thought that I’d make a new one.